The axadi or axai is a small quantity of oil that the oil press withholds as payment: Instead of the olive oil producers having to pay actual money for the services of the oil press, they give a small amount of the olive oil produced, that then gets sold to large olive oil companies, securing the income of the oil press owner. Propezoulopi is situated very close to Faros. It is a hill northwest of the settlement, with rocky grounds, overgrown with brambly bushes and wild-olives. This specific area is of great interest due to the placement of erect stones made out of limestone, with specific orientation. During the ‘50s, but even later, communication though mail or telephone was rather difficult. Especially in Ikaria that was a secluded island. Post-delivery took at least 20 days. In Aghios Kyrikos, the postman, widely known as “Theofilos”, went around the coffee shops, and with the help of a bullhorn, called for everyone to collect their mail. 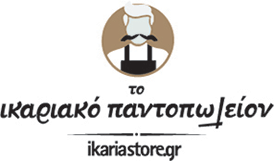 Ikariamag.gr organizes, for the 4th time, the Icarian Days of Contemporary Creations in Athens (àrtεις; fest). This Festival makes us proud, happy and above all, combines everything we love about this island, presenting our complex, weird view of Icaria, with the help of various old and new means. One Sunday morning… as I am going through some old photographs… my hands start to smell old developer fluid… Stuffed at the bottom of the box there is a yellowed booklet…. “Raches of Icaria, an excellent locus for summer accommodation”. The stamp on it… Touristic Board of Raches, Icaria…. On the first page… April 20th 1932. Tsampounofylaka is the Ikarian name of the ancient Greek bagpipe (also known as thylaki, fylaki or tsampouna). An apparatus storing air, memory, along with delivering musical notes, dance, celebration, and nostalgia. A musical instrument that connects the bacchanalian origin of our civilization with our pastoral lives. After all, the wine and the goat are the two feet on which the whole Ikarian civilization stands on. Since I was little I remember a photograph of my mother and her friend, Kotsana, at Chalika. Both wore closs skirts and had their hair in braids, looking like actresses out of an old Greek film. What a great fashion, such beautiful girls! The peony is one of the most Impressive wild flowers of the Greek mountains and nature has gifted Ikaria with an extremely rare, and one of a kind subspecies. We find it, with a lot of effort, on the rocky slopes of Atheras. It is an herbaceous plant, that prefers calcareous soils and shadowy places. If I had to summarize „summer on a southern island“ in one symbol, I would choose a figue tree. It might sound crazy, but this fruit tree is very special to me. First of all : I don’t have easy access to it. As I am living in a Northern country of Europe, normally I do know figues only from the super market, where I can buy them for a high price and let’s not talk about the taste, you get for it. Most early 19th century Icarian immigrants entered the US via the Ellis Island immigrant processing center in New York Harbor. According to ship manifest records, some stayed in New York, but the large majority listed the Pittsburgh area as their final destination, with many of them settling in the nearby borough of Verona. Early Icarian settlers in Pittsburgh started out as laborers and painters in the city’s numerous factories and railroad yards. Most did not intend to make America their permanent home. Their goal was to save up enough money for a better life in Icaria. A few became shopkeepers and merchants providing goods and services to other immigrants. Some became contractors, hiring and recruiting other immigrants to take on large industrial maintenance jobs.